Note (09/25/2018) -- given that this is six years old and that we know more (see Remarks, this date, below), this post ought to be updated. We'll start with Dr. Frank's work and the Great Migration sketch (including a wiki counterpart) as part of the foundation. From there, we'll build a sketch that has support. From this, we'll start to fill in the pieces in a reasonable fashion. Where things are conjectural, of course, this will be noted. Aside: All progress comes from testing hypotheses which are framed from a good basis. Too, there is always the mainstream. That off the mainstream is not, by necessity, quackery. Of course, the smell test is useful when other means don't exist for proper analysis. We'll summarize the Dr. Frank and Great Migration material, as one task. However, to set the tone of the overarching guideline, please consider the following as a list of key items. - Thomas was put in charge as Overseer of the Cape Ann venture, at least, that part related to planting on the new soil. This implies several things, such as that he was known to Rev. John White and the Dorchester Company, that he had a good character, that he capable of carrying out the plan, and a number of other things. We'll expand upon these as we go along with our efforts to describe Thomas as the quintessential American, albeit a little early for his times. - Thomas was referred to as 'Mr' in a London meeting in 1629 which, again, suggests several things, such as that he came from a good family, that he was educated, that he had social stature (but we could bet that he had a large physical stature and a character that was bigger than life), and a lot more. We'll collect more information about this and what it might mean. - Thomas brought his wife and family which means that he was committed. Of the Cape Ann crew (old planters), he and Margaret were the exception. And, their resolve is proven by their children and their descendants. Of course, collecting information about this is an on-going effort. Another committed individual was John Balch who brought his wife. Many Balchs are descendants of Thomas through his daughter, Sarah. - Thomas became a freeman later than he could have which implies several things, such as that he was effective in his own manner during the period before he signed up, that he decided to join in order to participate in a larger scope and to take care of things that needed to be done for the community, that he compromised for the well-being of his children and more. - (07/12/2015) See Remarks, this date, on project exploring records found in Sherborne, Dorset regarding the marriage of Thomas Gardiner and Margaret Frier (and more). In short, we're talking about a story that ought to have wide interest if done properly. That Thomas was above history is a known fact. What we want to capture is the spirit of the remarkable pair who survived troubling times and who left a definite legacy that needs to be studied and documented. Lessons from their, meaning Thomas' and Margaret's, lives are applicable in today's society in ways that we have not even begun to address. Taking on the task of introducing history to Thomas is one task of the Thomas Gardner Society. That was one motivation behind the Backbone series. 03/12/2015 -- What we know implies that there are things that we do not know (so, we'll cover both; albeit, unknown unknowns lurk). 03/03/2015 -- The 1933 book is on-line. See Zouch Phoenix. 09/29/2014 -- As of this past week, we know that a couple, Thomas Gardner and Margaret Friar, married in Sherborne, Dorset in 1617. 03/28/2014 -- See Vol. IV, No. 1 for a discussion of the movement from Cape Ann to Salem. 01/24/2013 -- We know a whole lot. We ought to map the unknowns to what we know. Then, unknown unknowns will start to fall out. Sound like fun? 11/27/2012 -- We need to tell the negative tales too, such as Rev. John's disrespect of those who put their lives and well-being on the line and more. The Maypole allusion grates several ways. Poor Thomas had to deal with three Johns: White, Endicott, and Winthrop. This post continues the discussion about the wives of Thomas (see About Margaret). Were there two or three? As mentioned in the prior post, Dr. Frank wrote that Thomas had two wives (as did Savage). Of course, he was writing 100 years ago (Savage even further back), and, surely, there has to be more information at this point about the matter. The question then becomes, given the current state, can we really know? Or, to put it another way, was Dr. Frank wrong? That has not been shown, in our opinion. Let's look at a couple of studies that are of interest. There are, of course, more of these which we expect to get to, in time. Too, we might add as a preface, some of the needed information is awaiting us in the old country. So, that means that we'll need to look into what genealogical studies might have been done in England about Thomas. The fact is that we're dealing with events that are long past and about which we have little information, at this time, for various reasons. Many views have been expressed about the relationships between the Gardner families (or see Savage) that came here. Too, one sees various proposals that have come to fore. The modern study, mentioned below, does not broach the subject of origins at all. In regard to genealogy in general, just in the past week I've run across scores of books that have been outdated yet are being quoted. It is very easy for misinformation to be propagated via web pages. Our intent is to have material that can be considered reasonable and supportable. Now, for starters, let's put two studies together, side by side, and make a few comments. Then, we'll rephrase our current position, until there is further information. This image brings together material from The American Genealogist and from the The Great Migration Begins. The former had an article in 1953 that was written by George E. McCracken and that was titled "The Salem Gardners: Comments and Clues." Topics covered in the article include origin, Margaret, Seeth, the first wife of Thomas the son, the wives of George (very long), The Salem Quakers, the Flight to Connecticut, and the Salem Shattucks. The latter is a recent book in which Thomas has six pages written by Robert Charles Anderson and published by the NEHGS. So, if we take the TAG article first, it goes a lot into areas that needed some study. The section on Margaret is small. The author, essentially, agrees with Dr. Frank about two wives. However, we don't know Margaret's family name. What I note is the author's insistence that these studies would greatly benefit from looking further into the collateral families. That being said, the work of Dr. Frank is phenomenal and greatly appreciated. Now, the Anderson study is looking, potentially, at 1000s of families and doing this with an eye to being correct. The best way to do that is to only use sourced material. Did Anderson make an exception in this case? I would like to consider further his hypothesis and proof after seeing the material that he is quoting. I don't buy the church reference. Thomas did not become a freeman until 1637. That is more than a decade after coming over. How could this be? Basically, we would suggest that he was able to get by using his own mode until his sons were older. And, he and Margaret could have easily done this together. Then, he would have had (deign to join) to be more of a "conformist" (to the puritanical thought and behavior) so as to not handicap their futures. From what we can see looking back, Thomas' and Margaret's children did well. Aside: There is no record of a first wive's death or of another marriage. We basically know about Thomas and Damaris, who was a widow in 1641, through his will. Hence, the conjectures abound. That Thomas married a Quaker tells us much about his character, especially in comparison to some. We'll forgo that analysis for a time. In any case, Thomas would have had to be in the church, and active, to be a freeman. He was shown on the rolls early; but, was he regular in attendance? In the case of Margaret, just picture a women dragging a bunch of kids to the Sunday service. Again, did she need that? There seems to be something there to look at in this regard. In fact, it's a story (or many stories) waiting to be told. By the way, the above is not a criticism. The Great Migration work has been really helpful and takes the right tact in the case of unknowns, or little knowns. That is, if you don't have something definitive, then just punt it down the road. But, this work does not relieve families of their duties to honor their fathers and mothers. Which then brings up the family and efforts of Thomas' descendants. I can see someone taking TAG 30:156 and the Great Migration work further. It may be that there is a lot more information available that needs to be looked at and digested. This is so especially with the booming cloud'd informational sources which cause more stuff to appear all the time. In the meantime, though, we say two wives. But, then, it could be three. You know it does not matter, right now. For anyone doing Gardner genealogy, the use of either has no impact on the tree unless one wants to branch out with the first (and/or second) wife. It is nice that the Shattuck family has their information filled in. 08/01/2018 -- The past few days, I have been on WikiTree. We are looking at settling issues for the profile of Thomas (and his spouses): Gardner-159. These profiles are being set up and maintained by the Puritan Great Migration. Expect an update blog post within the next day or so. Notice the recent comments (the 'unknown' is because I juggle many email accounts and was in the wrong one - it's not that I'm old). 05/05/2015 -- The Winthrop Society has Margaret as second wife. They allow submittal of additions and corrections concerning early arrivals. 10/03/2014 -- Notice that McCracken mentions Felt, Dr. Frank A., and Moriarty and that he mentions we need to know more. Now, why was this record missed? Well, for one, it is rather smudgy. That it was found can be attributed to the digital age and people using newer tools. Too, to have found this, one would have had to page through lots of paper. Of course, indexing helps with that, assuming that those who do the transcription that led to the indexing were careful. One has to ask, though. Were researchers blind (many senses meant - to be updated)? 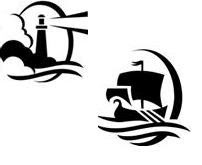 01/08/2014 -- We added Earlier Settlers of Nantucket to our Bibliography. It's interesting to see the Folger stories of the early Gardners. ... In another place, we saw both Richard and John being described as well-educated. From whence that education? The parents? If you say no, you're not very much insightful about human nature. A child's first teacher is the mother, then the father. So, if Richard and John were Quaker, well-educated, and good citizens of their community, the mother deserves a lot of credit. Now, who was she? In Hinchman's book, Margaret is noted as the mother. We'll have to look to see the source for that. If it does come down as family history, then one would think that the children would have known their mothers. In any case, Margaret, or whomever it was, needs to have recognition as being early-Quaker (definitely, before Fox made his splash upon history). 12/31/2013 -- The arguments against three continue. Anderson, in his write up of Gardner, has Richard's death as 1724 (see image). 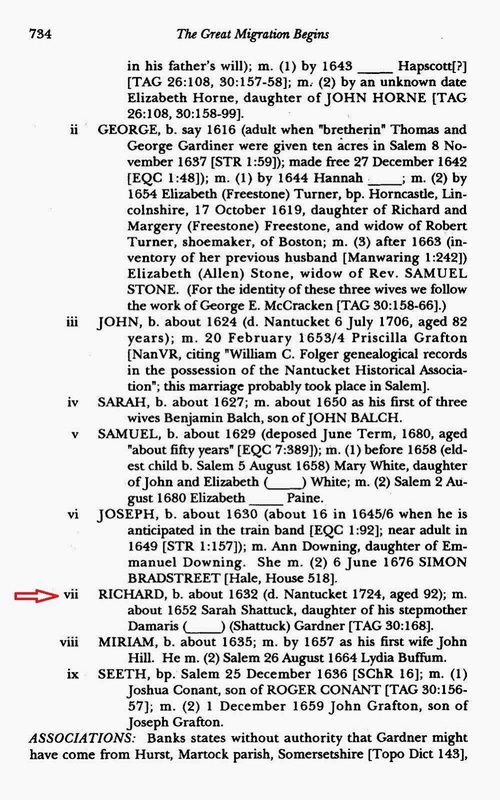 This information was picked up from TAG, yes, but the death year applies to Richard's wife. Richard died in 1688. 11/28/2012 -- It becomes even more curious as Lemuel Shattuck suggests, in his Memorials (via Google), that Damaris and Thomas got married after 1641 (no indication of it being long afterward). By the way, I found this book by reading TAG 30:156's other sections. McCracken mentions Lemuel who I had not run across before. Aside: the amount of digitized work has expanded almost without bounds of late which gives me hope that we can find out more about Thomas and Margaret (yes, I'm talking UK books, to boot). 11/27/2012 -- Let's itemize what we know (including use of the Great Migration sketches), re-iterate some basics, and the proceed constructively. 11/27/2012 -- One thing that I've noticed while pursuing information is that some sites assign a rating to what they have. Usually, it's a simple integer. However, we could get a little more precise. Perhaps, modern material can have a certitude of 1.0, but how could one obtain something other than the high 90s for older information? And, information from 400 years ago will be highly variable. Yet, one could classify the material and then rate within that. Complicated? The one thing that we would hope would be that later studies raise the rating rather than lower it. But, then, that is not necessarily the fact. We always look back and wonder about the motivations behind picking up from a known situation and venturing, whole heartily, into something new. Much has been written about the religious and political factors which we'll get to at some point. And, there are reasons for looking back as we can try to discover origins of Thomas and Margaret. As an aside, that Thomas was referred to as Mr. Gardner at a meeting in London (ca 1629 -- see Hubbard or Perley, for the exact year) speaks much. The economic influence will be important, to boot. And, there is much to look at in this regard. 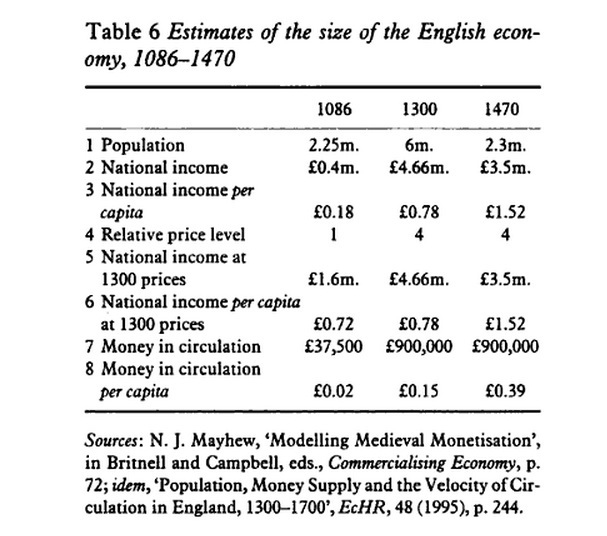 Britnell in his The Commercialisation of English Society, 1000-1500 (Manchester Medieval Studies, 1996, Manchester University Press ND) takes a deep look at this 500-year period. Toward the latter part, workers were allowed to move between cities (as opposed to the law that forbade movement - consequences were dire - if caught outside one's parish, one could get whipped, lose an ear, or be executed). One reason for moving might have been to join a group of free men, according to Britnell. On seeing that, I thought of my remark about Thomas not needing to join. There is a lot to discuss there. However, a real factor that is not talked about much, and there were outbreaks in the 1600s and 1700s, was the black death. 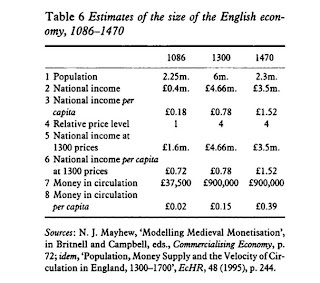 Britnell's table shows the size of the English economy at three different times. What stands out is the drop in population between 1300 and 1470. A lot of this was from the plague. A plague in Weymouth, England says that the plague entered England in 1348 through its port and killed up to fifty percent of the population. By the way, 1470 would be about the time of the start of Thomas' grandfather's life. Any look back that connects us to Thomas' or Margaret's ancestry, and any of the other 1000s of immigrants, would run into its influence on the populace. 03/27/2019 -- This is a topic covered under the subject of General Crisis.